10% discount on your first order and FREE UK standard shipping. Use SJM10 at checkout. Coloured leather belts – a new product added to my store! Whilst my leather belts are pretty classic for both their style and colour range, these new coloured leather belts will help to add a subtle colour flash to any outfit. Read moreColoured leather belts – a new product added to my store! I am very pleased to have been accepted to trade at the South Coast Makers Market. The SCMM is a pop up Makers Market being held on the 18th November at the Corpus Christi Parish Centre, St James Square, Boscombe. 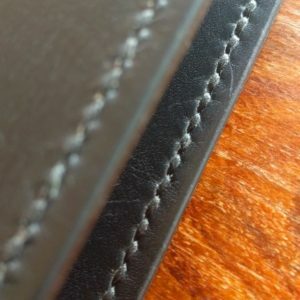 Over the next few weeks I will be putting together a new leather notebook cover design and I’ll be documenting the process in a series of posts here on my blog. I make another notebook cover specifically for Moleskine notebooks. If you’d like to be notified of each new blog post, why not join my mailing list? Fans of this Victorinox classic will be happy with my latest product… a lovely little leather Swiss Army Knife pouch to keep your knives clean and safe.